Is it already the middle of July? Hard to believe, and yet it must be, because the mid-summer flowers are blooming their hearts out. I’m actually pretty happy with how the garden looks right now. Let’s cover the highlights, starting at the sidewalk border. The Monarda didyma ‘Raspberry Wine’ is at its peak, and I’d say it pairs well with the smaller lavender flowers of its cousin M. fistulosa. 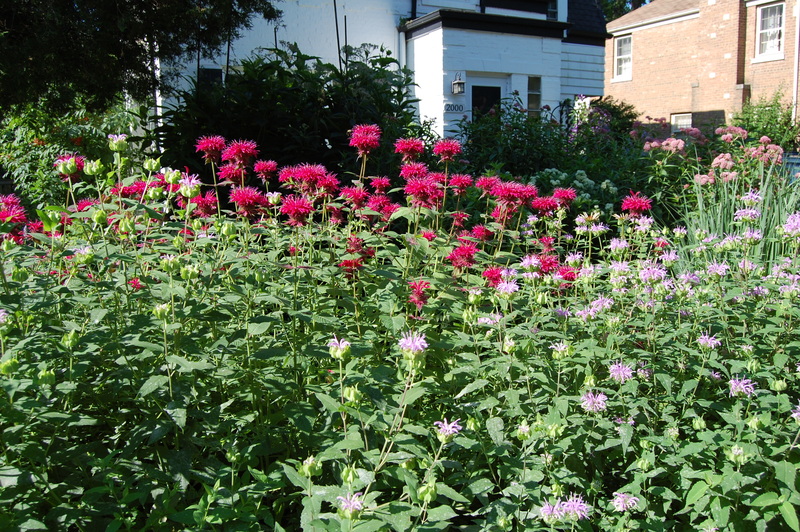 The common names are Bee Balm for the luscious red flowers, Bergamot for the more demure lavender. Swamp Milkweed (Asclepias incarnata) is providing most of the color in the front island bed, both the straight species and the cultivar ‘Ice Ballet’. I really should have cut back the straight species this year, with all the rain it has grown to 5-6′. ‘Ice Ballet’ stays one to two feet shorter. ‘Ice Ballet’ with the straight species standing tall to the rear. In the driveway border, Culver’s Root ‘Inspiration’ (Veronicastrum virginicum) is filling in nicely, with far more blue flower spikes than last year. They have a somewhat otherworldly look, but are still very popular with the bees. The Butterflyweed (Asclepias tuberosa) is just a bit past its prime, but is blooming together nicely with the Daylily ‘Eye-yi-yi’. 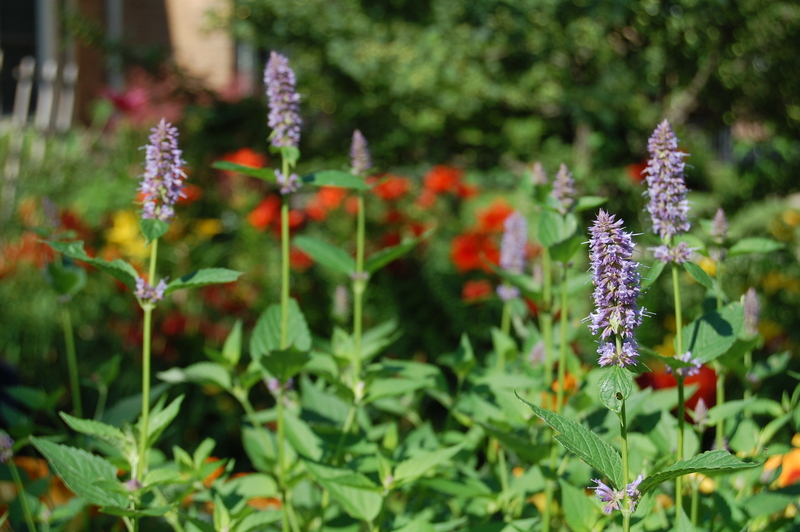 Anise Hyssop (Agastache foeniculum) is just starting to add some blue to all the orange here. Anise Hyssop with Asiatic Lilies in the background. The flower spikes get about twice as long. Oh, and I shouldn’t forget the Early Sunflower (Heliopsis helianthoides) ‘Prairie Sunset’ at the south end of the border near the house. In the lands west of the driveway. 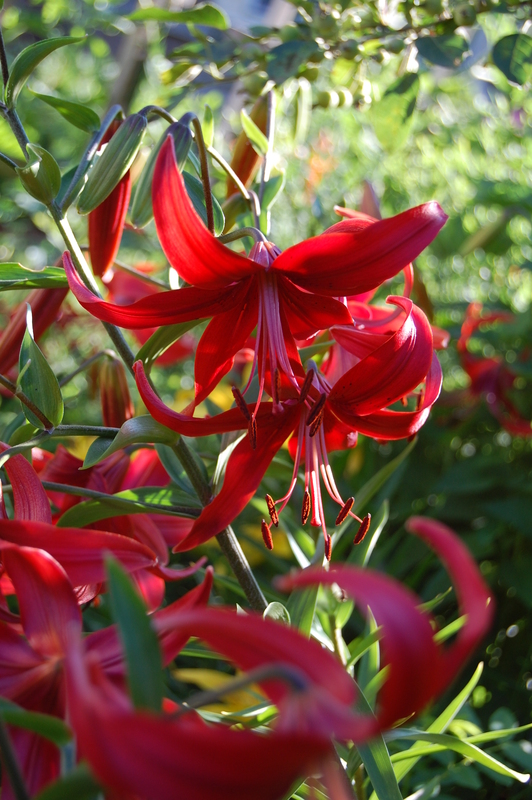 the Asiatic lilies are the undisputed stars right now. As noted in a previous post, these come from a naturalizing mix and I’ve forgotten the variety names. And guess what? 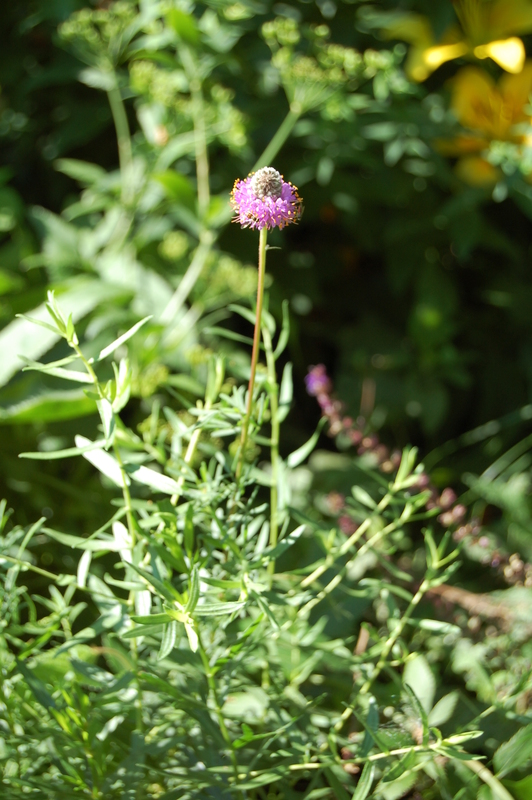 I planted three purple prairie clover (Dalea purpurea) north of the crab three years ago. I thought all were goners, but one has popped up, looking reasonably vigorous, and is just starting to bloom. Doesn’t look so exciting now, but when you have a clump it does look nice. Also a great pollinator plant. 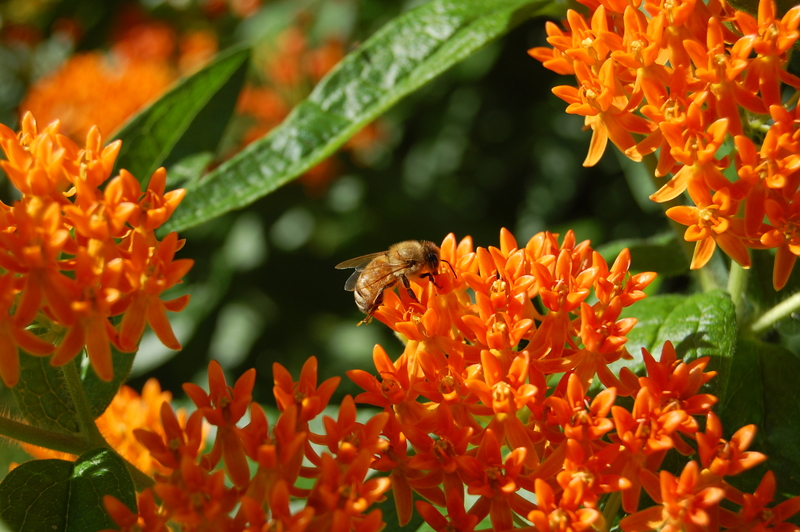 We also have some more butterflyweed over in this area, making the bees happy as it always does. The Ohio Spiderwort is still blooming in the parkway, next to some daylilies (name unknown) that came free with an order from Oakes Daylilies in Tennessee. 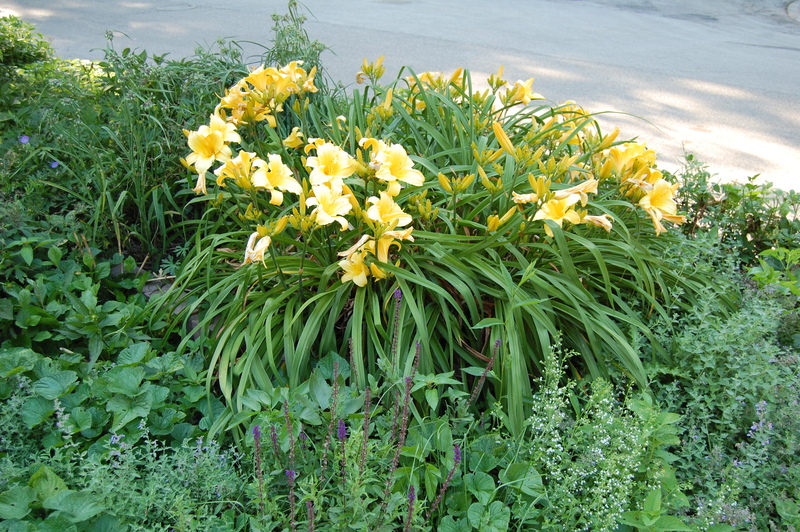 Theses gratis daylilies are quite happy with their move to Chicago, and have become rather enormous. They always make me think of bananas. Daylily that makes me think of bananas. So let’s head towards the back. We’ll pass the containers on the front steps and the vegetable plot. I’ll do separate posts on them later. But we should stop to see the Clematis jackmanii, which is still going strong. Not a lot of blooms in the back garden right now, unless you count the containers, which I’ll post about later. 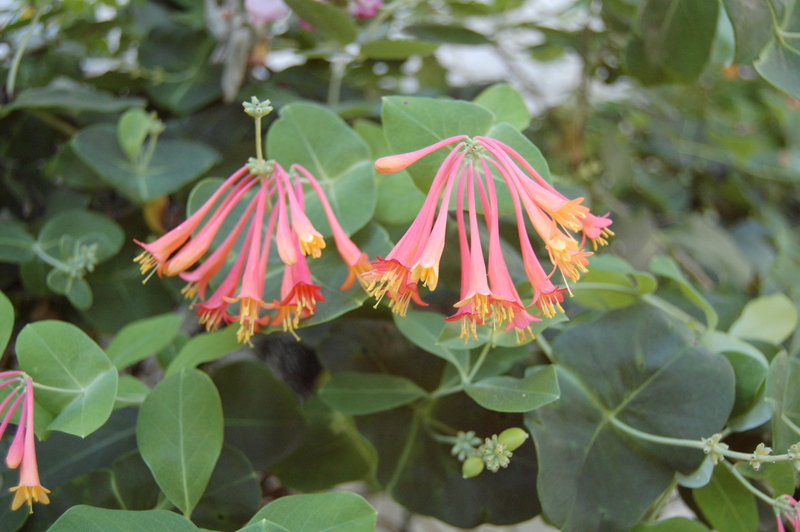 The Trumpet Honeysuckle (Lonicera sempervirens) continues blooming, as it has since May. What a great vine! There’s the Elderberry (Sambucus canadensis) with dinner plate-sized clusters of little white blooms. 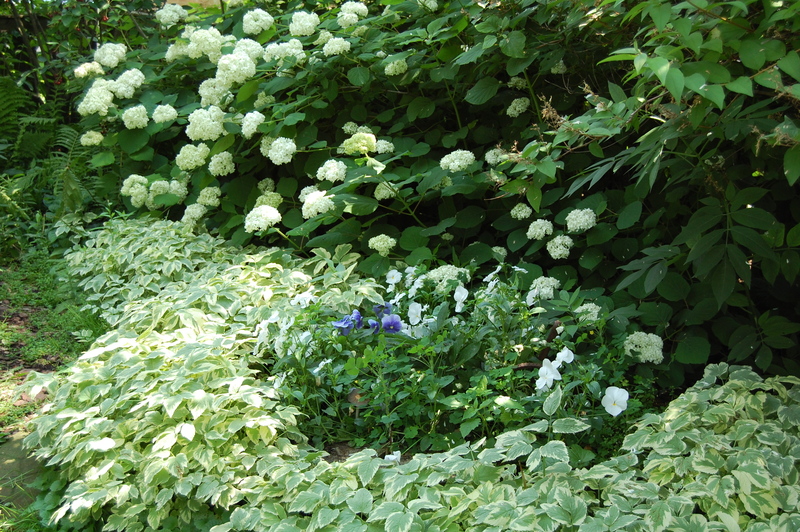 Plus some ‘Annabelle’ Hydrangeas. (I think they’re ‘Annabelles”, they were there when we moved in.) There’s also the Purple Milkweed (Asclepias purpurescens), which has been very accident prone this year, with several broken stems. This plant has been limping along, but not really thriving. To help it I have removed some asters and replaced them with a lower growing plant, Indian Pink (Spigelia marilandica). I’m looking forward to their blooms next year. 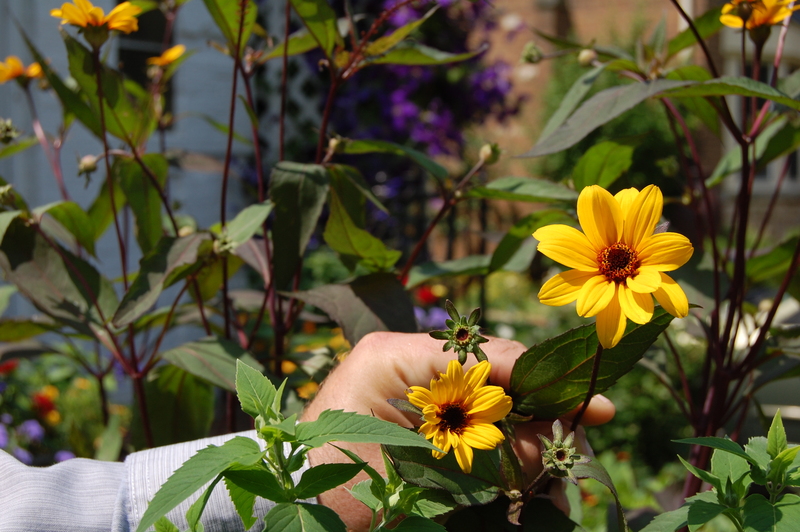 How are the flowers blooming in your garden? Very well, I hope. Garden Bloggers’ Bloom Day is sponsored by Carol at May Dreams Gardens. Check out her blog for links to blooms in other gardens. Beautiful! I’m loving so much in your garden. 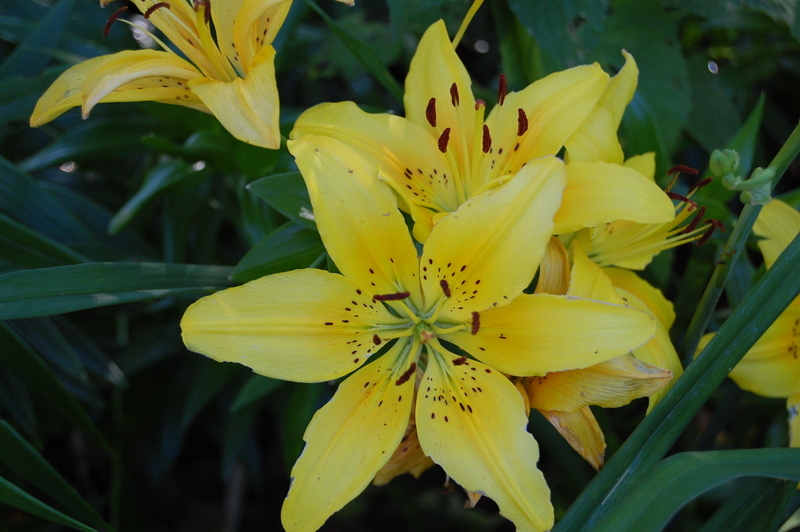 The lilies are stunning. I can see why they are stealing the show but everything else is not far behind them. I’m thinking I need more lilies, but I want the fragrant ones, either orientals or orienpets. It really looks great in your garden. i have sowed some red monarda this year. They are lovely. 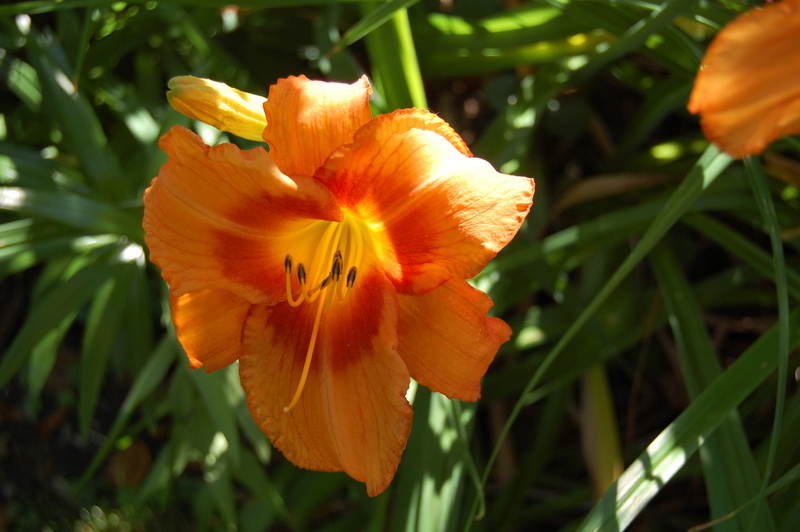 I especially like the orange bed with the daylilies and your clematis is fantastic. It is very dry here at the moment but I water some of the plants. We were getting tons of rain but it has gradually been getting drier starting a week ago. I’m very fond of orange, you maybe can tell. Everything is looking good! Love the clematis and the lilies are amazing (the red is my favorite) I am also amazed at how many of the same flowers and shrubs we share. Great minds? What other explanation could there be?!? I’m glad to see that you grow so many natives-or hybrids from natives. With all the rain we’ve had it’s like a jungle here.The hosta are loving it. I’m a big proponent of natives, but I could never limit myself to them exclusively. Your garden is stunning. I love Clematis but have never had one that looks like yours. I am thrilled if I get two or three blooms. Do you find Trumpet Honeysuckle to be overpowering/invasive? No, Trumpet Honeysuckle is well behaved. Trumpet Creeper (Campsis radicans) is a monster, though some people manage it. Also the invasive exotic Hall’s or Japanese Honeysuckle is a major problem. Looks great, what a show the monarda is putting on! (mine is a mildewed mess this year), also I like the prairie sunset. I almost got it myself a couple times but mine always seem to get those red aphids… oh and of course I love the lilies too! Mine gets the red aphids too but I just choose to ignore them. Love that Swamp Milkweed. I have a small start here. It’s first year. It has just sat there contemplating it’s fate. I hope it takes and I have tall spires of blooms next year. Happy GBBD. Give it time. If it has sun and moisture, it will serve you well. May take a third year before it is really impressive. What an exciting show there is in your garden. Your view of the Hydrangeas looks peaceful. Yes, the back garden is much more tranquil. The excitement is in the front. It looks to me like you have a lot of great pollinator attractors in your garden. Beautiful! Thank you. A lot of the plants do appeal to pollinators but there definitely are not as many as usual this year. Love your bloom day flowers. Nice massing of natives, Jason! 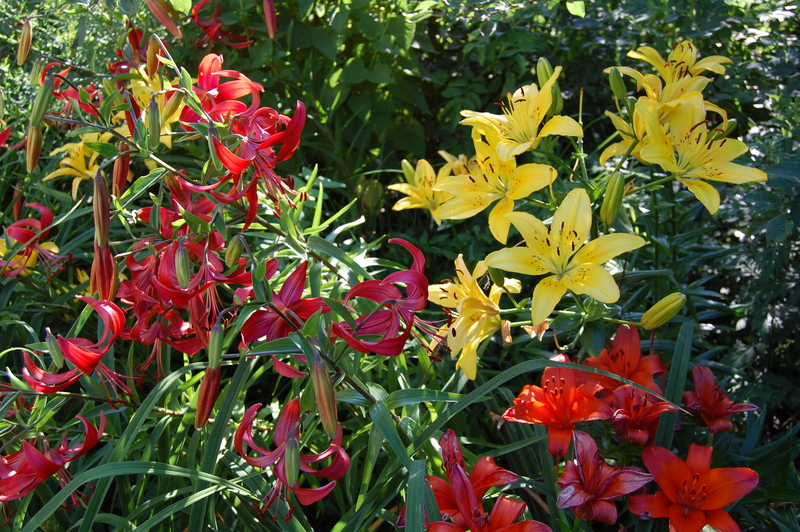 I, too, love that red lily. It doesn’t look too Asiatic though, with its down-facing flower with the spider splayed petals, more Martagon-y. I’m sure you’re right, though it was sold in an Asiatic lily mix. Jason, red lily, blur clematis. hydrangea, Swamp Milkweed — I love them all! Those are four of the stars, for sure. Bananas! I just added some really wild colors to my garden. A few have bloomed. but so many more on the way. But like you, I have the banana varieties too. Are you having a scorching GBBD? We are. It is in the 90’s and so humid it is hard to breathe. Yes, last week and the weekend were very hot, seems to be cooling a bit now. Nothing wrong with bananas, I say. I love the rich saturated oranges (love butterfly weed, it never takes a bad picture) and reds and purples in your summer garden. My Jackmanii clematis is pooping out now, so it is great to see how robustly yours is flowering. After the gorgeous hot reds and bright deep colors, it was nice to end the post with those cool whites in the last photo. Nice. I agree, how can you not love butterflyweed? I try to keep the colors in the shady back to mostly white with some blue. With a few exceptions, of course. In your climate swamp milkweed might prefer afternoon shade, and of course lots of moisture. Beautiful! We’re trying to grow beebalm and anise hyssop from seed this year. When our cat ate the catnip out of the nursery, he at the anise hyssop seedling too! Oh no! Would it help if you just direct sow the anise hyssop seed? Thank you for the tour through your garden.We move into our new place is less than a month. 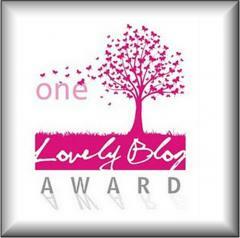 I know I want wildlife friendly so I will be referring to your blog frequently. Thx for the tip on monarda. Oy, moving is always so stressful, but it can be exciting too. Hope yours is relatively painless. Good luck with your new garden. I have Culver’s Root envy – love that thing! So cool! Bet the butterflies and the bees love your garden too – it looks wonderful! Thank you! We do get a lot of bees, though there are fewer this year. Not many butterflies either. Cold spring must have kept the population down. Or pesticides… You know, I read this really interesting article about bee-keeping in the middle of Paris. Apparently the farmland surrounding the city is pretty heavily sprayed with various nasties, so the beekeepers have taken over the roof tops. The parks are a lot cleaner and favorable to wildlife. I think it said there are over a dozen hives on the Paris opera house alone! Pretty cool, huh? That is, though it is disappointing to hear that the EU countries are also really bad about pesticides. I had gotten the impression they were much stricter in what they would allow. That’s the best-looking milkweed I’ve ever seen, and I love that spiky Veronica! You’ve sure got a lot going on in your garden and it looks fabulous. 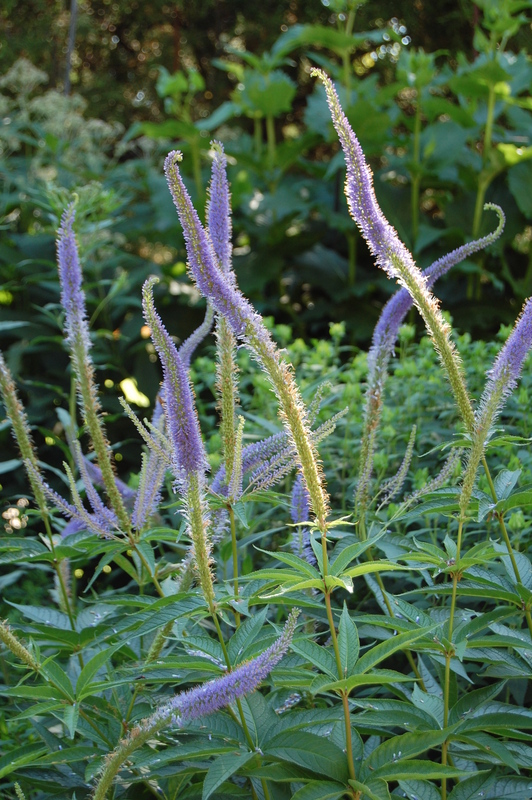 The blue Veronicastrum has become a favorite of mine. Oh man, that swamp milkweed is gorgeous! Wow wow wow wow wow. I like that swamp milkweed. I need some for my garden. 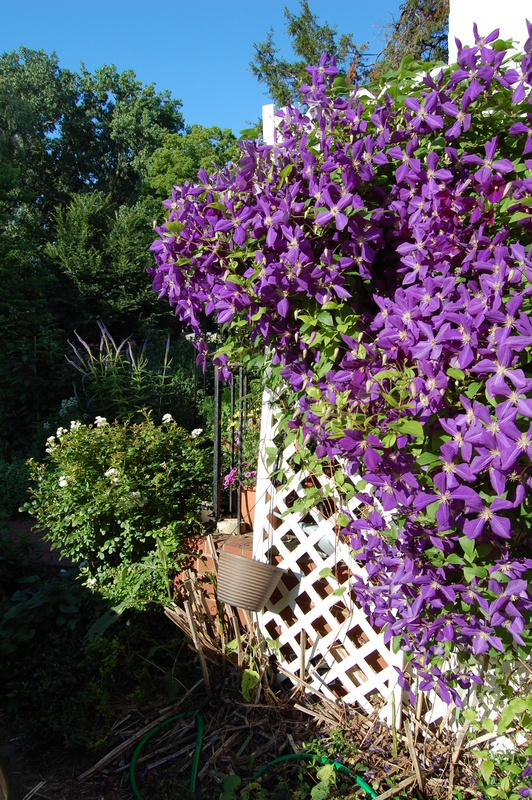 And that clematis – fantastic color! I think swamp milkweed would do ok where you are. 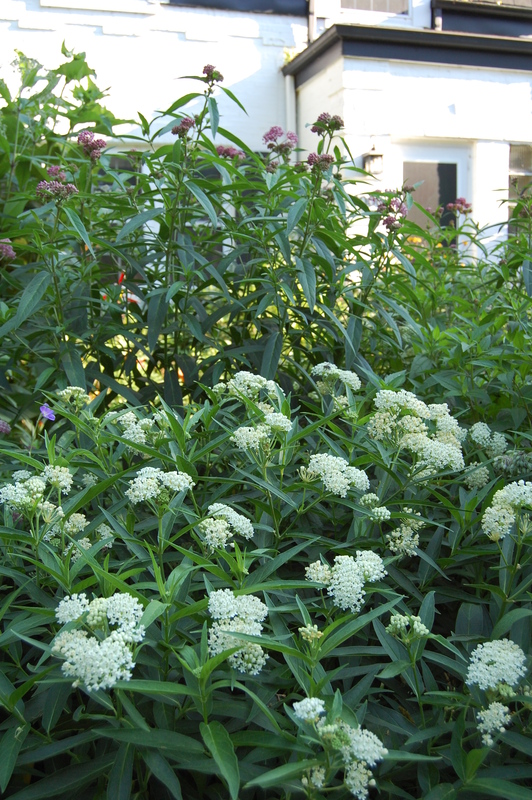 LOVE that swamp milkweed…so gorgeous…and YAY for your Dalea! I just planted my first one…hoping it thrives! 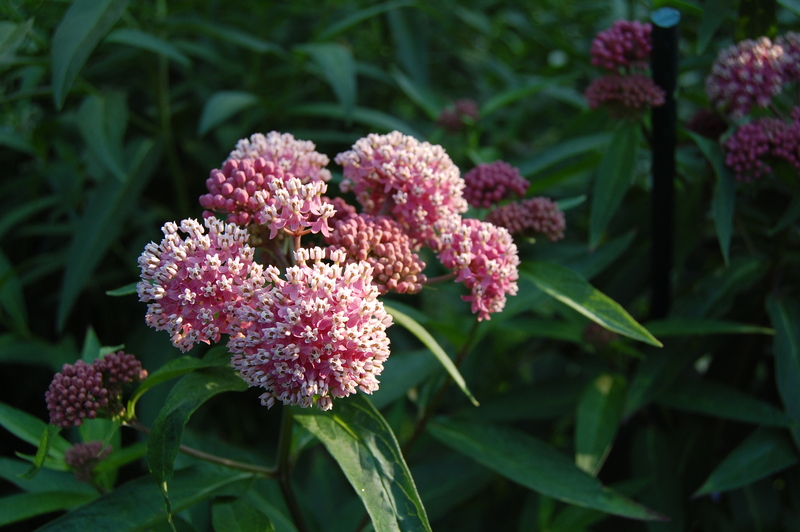 Isn’t the swamp milkweed great? I love the two tone effect of the lighter and deeper pinks. You have such amazing flowers. 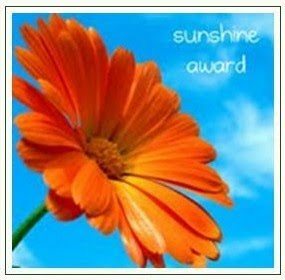 Your green fingers have worked its magic in your lovely garden. 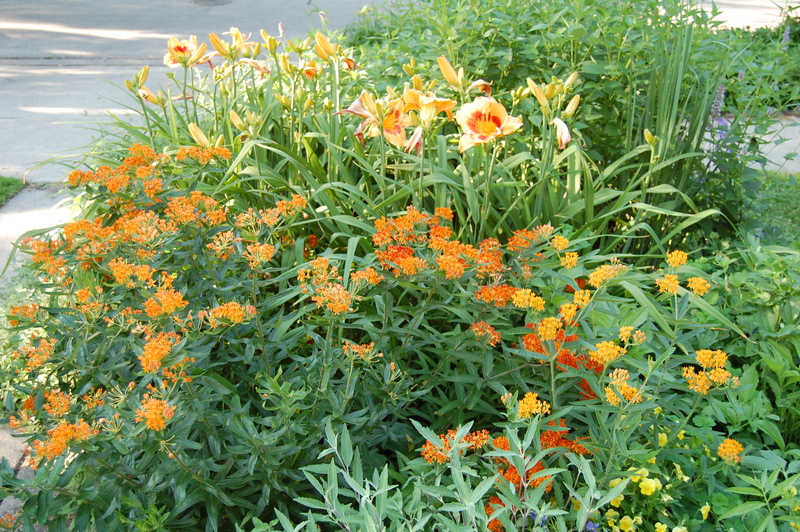 Asclepias tuberosa paired with Hemerocallis ‘Eye-Yi-Yi’ is just a perfect combination of oranges. Just perfect! Happy GBBD to you! Glad you liked the combo! Actually, those were just avatars. Happy GBBD! Isn’t summer grand…you must enjoy the gardens so much. Yes I do. Don’t we all? I especially like that wonderful purple Clematis! Thanks! This year and last the clematis has been really outstanding. Your flowers look amazing,particularly the clematis. How old is it? Thanks. Four years, I think. Your garden is looking amazing! I don’t know what I love more — that fabulous Clematis, the deep wine color of the Mondarda, or the trumpet honeysuckle (definitely on my wish list for my new front garden). I definitely recommend the trumpet honeysuckle, it is perfect in every way but one: sadly, it is not fragrant. Looking fabulous, Jason. As always. Your taste in lilies reminds me of my parent’s garden; makes me miss home. Happy GBBD! Happy GBBD, Sarah! I do love lilies in bright colors, but I also like softer white and yellow lillies. Not too fond of pink, though. Your purple clematis is gorgeous. I also love your trumpet honeysuckle. I have one, but is has barely bloomed. i have planed to move it to a sunnier spot this fall. I think it can take some shade. How long have you had it? I’m intrigued by the plants you grow. You have things that would be tender for me and other plants that need lots of water. Anyway, whatever your climatic conditions are your garden is looking fabulous! The plants that are tender for you I must be growing as annuals. I do have some plants that love water. Generally they are in locations that stay pretty moist. 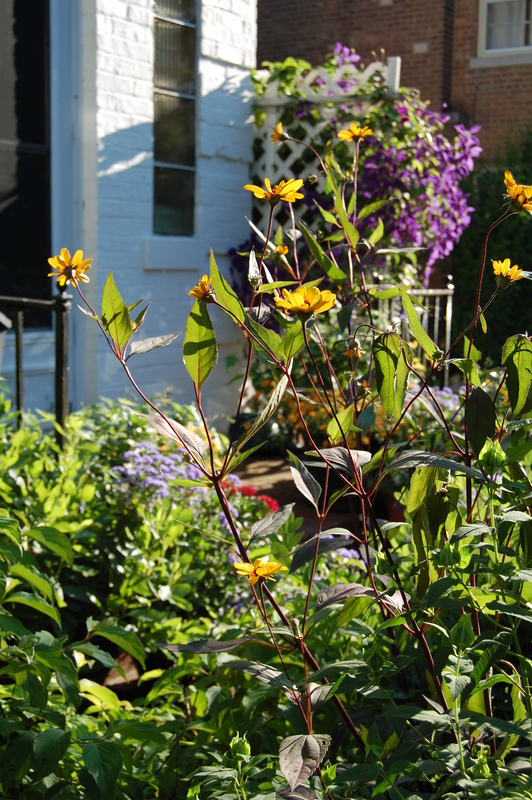 A few I will give supplemental watering, such as the Joe Pye Weeds in the driveway border. Whenever I water the containers on the front stoop I leave the hose at Joe’s base for a half hour or so.